ASIA’S real estate investment trust (REIT) market has been growing at an impressive rate, from a mere US$2bil in 2001 to a whopping US$48.23bil in market capitalisation as at December 2008, Asian Public Real Estate Association (APREA) chief executive officer Peter F. Mitchell said. “There is enormous growth potential for the REITs industry in Asia, especially if more funds are channelled to the industry in this region,” he told StarBiz in a exclusive interview recently. Mitchell said while the growth potential (of REITs in Asia) was good there were several stumbling blocks that were slowing its growth. “Asia’s REIT industry is still fragmented and poorly represented,” he said, adding that there was a lack of unity and many cross-border issues had to be resolved, compared with Europe and the United States, which have powerful representation. Moreover, he said, while the REIT industry, like all other asset classes, had been impacted by the current global financial crisis, the biggest problem facing the industry was the unequal allocation of property investment funds. “A lot of the global fund managers are still biased towards investing in the West, despite returns and growth often being more favoubale in Asia,” he noted. APREA is a non-profit industry association representing real estate members (listed and unlisted) in Asia Pacific and the organisation was formed mainly to promote and develop the REITs market in Asia to local and foreign investors. Currently the bulk of global real estate funds are channelled to the Netherlands (where REITs started originally), Australia, Germany, the United States, Britain and France. In Asia, Japan tops the list as the most favoured destination for global real estate fund managers, with Singapore coming in second. However, Mitchell said that in recent years Hong Kong, and countries in Southeast Asia like Malaysia, had also attracted sizable foreign funds into the local REIT industry. “We believe China could be a huge potential for the REIT market to flourish once regulatory and land issues are ironed-out,” he noted. On the performance of local REITs, Mitchell said REITs were generally defensive in nature and that in recent months (from January) Malaysian REITs had outperfromed the Kuala Lumpur Composite Index and only in April did the equity market perform better than REITs, as global market conditions and sentiment improved. “In the republic’s case the REIT market is likely to be in an overbought position or saturated point and probably needs some cooling off,” he said. Overall Malaysian REITs had in the past three to four mont hs performed fairly well, compared with the REITs markets in other Asian countries, out-performing developed markets like Japan, Sinagpore, and even Hong Kong. Mitchell said there was good upside potential for Malaysia REITs in the mid to longer term. Some of the local REITs that had performed exceptionally well in the past seven months (October 2008 to April 2009) in terms of percentage change in market capitalisation of individual REITs include Al ’aqar KPJ (22.32%), AL-Hadharah Boustead (18.42%) and Amanah Harta Tanah PNB2 (9.86%). 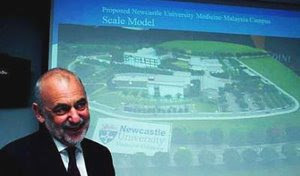 BRITAIN’S Newcastle University Medicine (NUMed) wants to position Iskandar Malaysia as one of the leading higher educational hubs in the region. NUMed Malaysia Sdn Bhd chief executive officer Professor Reginald Jordan s aid its first international branch campus in Johor would be the main catalyst to promote the state as the preferred destination for medical studies. He said N UMed had received an overwhelming response from international an d local students since announcing the opening of its Johor campus five months ago. “So far, we have received over 200 enquiries to study at our branch campus in Mal aysia, ” Jordan told a press conference last week. He said the enquiries came from Malaysia and foreign count ries such as Egypt, India, Singapore, Sri Lanka, Europe and the US. The RM300mil campus on a 5.26ha site in EduCity is currently under construction in Nusajaya, which is one of the five flagship development zones in Iskandar Malaysia, and scheduled for completi on in May 2011. Jordan said before the Johor campus was ready, the first two NUMed Malaysia cohorts of 40 students each would undertake the first two years of the Bachelor of Medicine and Bachelor of Surgery (MBBS) prog rammes in Newcastle. He said they would return to Malaysia to complete the third, fourth and fifth years in Johor and, subsequently, from 2011, all five years of the MBBS programme would be established and delivered at the Nusajaya campus. “Our target is to enroll 185 students yearly from all over the world at NUMed Malaysia by 2013 and, by then, it will have 130 t eaching staff,” said Jordan. He said by choosing to study at NUMed Malaysia, students would obtain a reputable British medical qualification from an internationally recognised university a t a significantly less costs compared with a five-year medical degree programme in Britain. Jordan said that about 700 doctors practising in Kuala Lumpur and 7,000 others in the region now were graduates from the university. The university’s School of Medicine and Surgery was established in the city of Newcastle upon Tyne in 1834 and medicine at the university is currently ranked fourth in the Times Good University Guide 2009.